Red - Balloon, 12' tall, Fly Guy with 2 legs & 1 dual fan. Our balloon Fly Guy is made from 1.3 ounce rip-stop material. This product is also known as a fly guy, flyguy, sky dancer, air dancer, or tube dancer. Enormous inflatable huge balloon,inflate ballons,big balloons,rocket, jumbo dummy,sky balls, cheap balloons, large display. Advertising airblown rental, giant helium, gigantic air blown,inflatables. Outdoor blow up inflated party jumpers Colors available: Red. Size approximately: 12 '. We will custom imprint these Giant Waving Display Men with your logo, text, or custom artwork!Questions? Call us at 1-800-958-4332! Magenta - Balloon,18' tall, Red Fly Guy with two legs and two 18" diameter blowers. Our balloon Fly Guy is made from 1.3 ounce rip-stop material. This product is also known as a fly guy, flyguy, sky dancer, air dancer, or tube dancer. Enormous inflatable huge balloon,inflate ballons,big balloons,rocket, jumbo dummy,sky balls, cheap balloons, large display. Advertising airblown rental, giant helium, gigantic air blown,inflatables. Outdoor blow up inflated party jumpers Colors available: Magenta. Size approximately: 18 '. We will custom imprint these Giant Waving Display Men with your logo, text, or custom artwork!Questions? Call us at 1-800-958-4332! Dancing Inflatable balloon single leg 12 ft. Silicon coated ripstop nylon parachute fabric. Includes chest banner with 1 color art and 12" hi output fan. 1 year warranty on fan. Inflatables allow for an ultra visible, ultra unique, customized advertising option that is sure to get noticed. Create an unforgettable landmark today! Colors available: Cantaloupe, Kelly Green, Lime Green, Navy Blue, Neon Blue, Neon Green, Neon Orange, Neon Pink, Neon Yellow, Orange, Pink, Plum, Purple, Red, Royal Blue, Silver, Sky Blue, White, Yellow, Black. Size approximately: 12'.We will custom imprint these Giant Waving Display Men with your logo, text, or custom artwork!Questions? Call us at 1-800-958-4332! Floating 20' advertisement dancer. Set up in three minutes. Generate fantastic attention instantly. Heavy duty, powerful 1/4 horse power motor and fan that plugs into any 110 volt outlet and causes the floating dancing advertisement to sway and create attention for your business. Colors available: Brown, Green, Orange, Red, White, Yellow, Blue. Size approximately: 20'. Add $9.95 per letter or $150 for a logo.We will custom imprint these Giant Waving Display Men with your logo, text, or custom artwork!Questions? Call us at 1-800-958-4332! Giant Waving Display Men with a custom imprint! 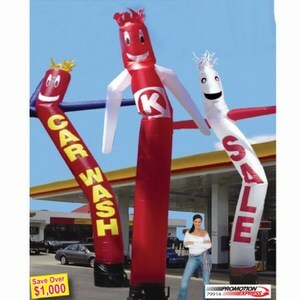 These Giant Waving Display Men can be custom printed with your logo, name, web address, phone number or custom design. Custom printed Giant Waving Display Men are a great way to get your message out there. Use imprinted Giant Waving Display Men as a trade show giveaway, promotional mailing to promote your company, product, message or brand. These Giant Waving Display Men can be used as a fund raising item for charity events, high school sports booster clubs or sold in school stores. 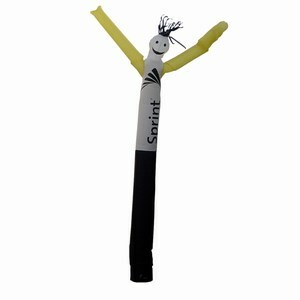 Custom imprint Giant Waving Display Men for birthday parties, Anniversaries or Graduation parties. 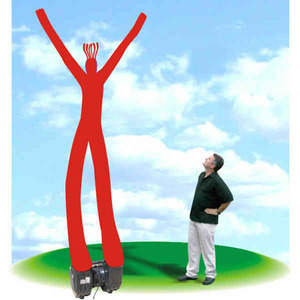 Items like these Giant Waving Display Men are used for Company Picnics, Weddings, Bar Mitzvahs and Bat Mitzvahs, Parties, Family Reunions, Fund Raisers and unique mailings. Ever search for a place to buy custom printed Giant Waving Display Men? Now you know that whatdoyouneed.com has what you're searching for! Thousands of otherCustom Imprinted, engraved, silk screened or embroidered items are here for you at whatdoyouneed.com. Giant Waving Display Men used as a handout or give-away are always appreciated by the recipient and your logo or advertising message is there for repeated exposure to your clients or potential customers. 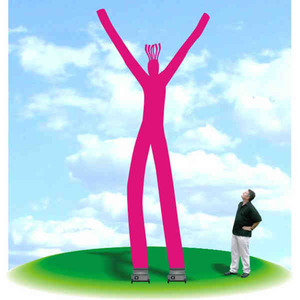 Giant Waving Display Men and other promotional items like them are used by small companies and huge corporations to help promote their brand, products and services. Promotional items are a proven marketing device. Just look around an office desk, car or closet and you will see printed promotional items like pens, ice scrappers, shirts, hats and jackets, all screen printed or embroidered with company and organization logos. There's a reason these people advertise on these promotional items; these items work! If you're looking for custom printed Giant Waving Display Men or any other type of promotional products, please call whatdoyouneed.com at 1-800-958-4332. Giant Waving Display Men, Custom Imprinted with your logo!